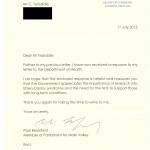 Shortly after the general election I decided to write to my local MP, Sir Paul Beresford. I wanted to ask what plans the new government has for funding and encouraging research into Ehlers-Danlos Syndrome. I also wanted to highlight the importance of early diagnosis and appropriate treatment of EDS to avoid long term disability. 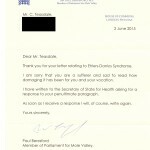 I received a polite reply soon afterwards to let me know Sir Paul had written to the Secretary of State for Health asking for a response to my questions. 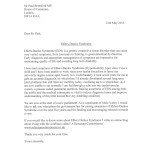 A few days ago I received a copy of the reply, written by Jane Ellison MP, Parliamentary Under Secretary of State for Public Health. Based on very modest expectations of what can be achieved with one letter, I think it’s an interesting response. Ms Ellison makes some general points about the aims of the NHS and improving outcomes for people with long term conditions. 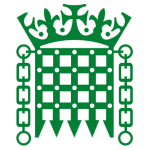 She also mentions the UK Strategy for Rare Diseases and its commitment to promote collaborative working between the NHS, research communities, academia and industry to improve understanding about rare diseases and how they can best be treated. 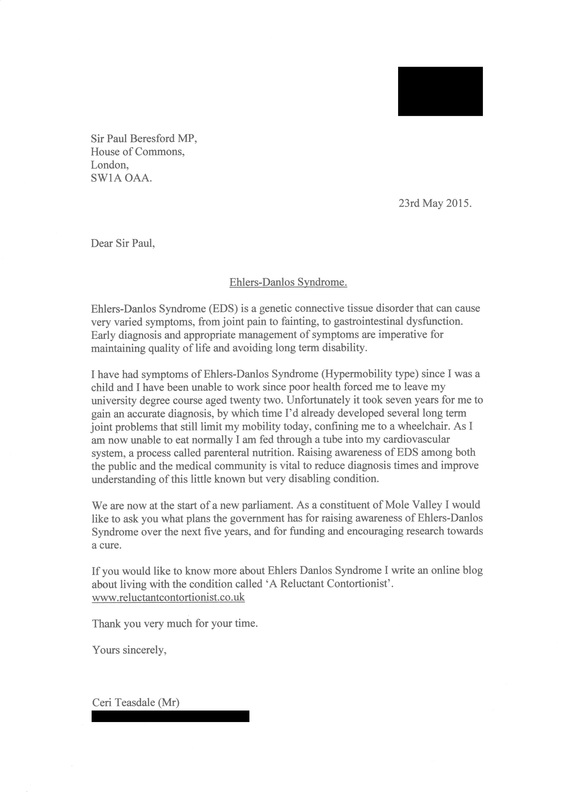 The most specific response to the questions I raised is a paragraph describing a study by the National Institute for Health Research (NIHR), which will investigate the genetic basis of rare inherited connective tissue conditions, mainly Ehlers Danlos Syndrome. I wasn’t aware of the study but they are currently recruiting for volunteers. I would like to apply myself but I don’t fit the criteria. If you would like more information about the study and the inclusion criteria you can read all the details by clicking HERE. No comment was made about the benefits of early diagnosis and management of EDS, which was one of my main points. 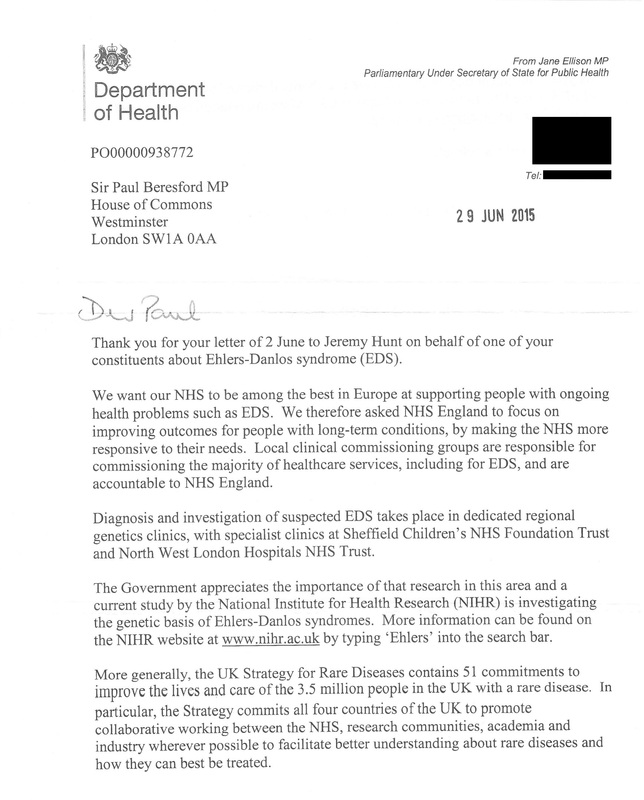 However I think my letter was worthwhile as a small reminder to the government of the difficulties faced by the EDS community, and the need for greater awareness and continued research until a treatment is found. 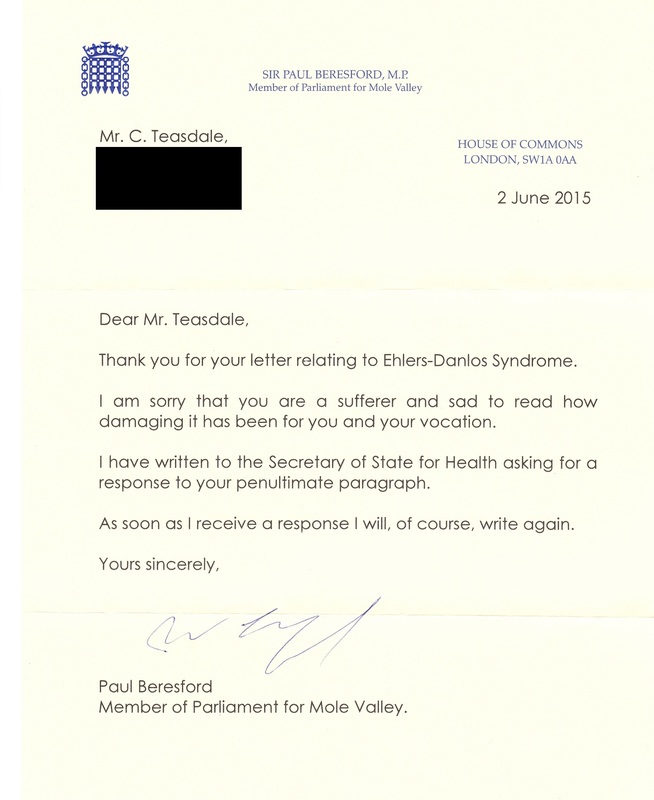 The letter closes by mentioning the charity Ehlers-Danlos Support UK. I’m already a member, but it’s good the government also appreciates their great work. Copies of all the letters can be viewed below. I’d like to thank Sir Paul Beresford MP and Jane Ellison MP for responding to my questions. Good response from the Minister, save on the points you identify. 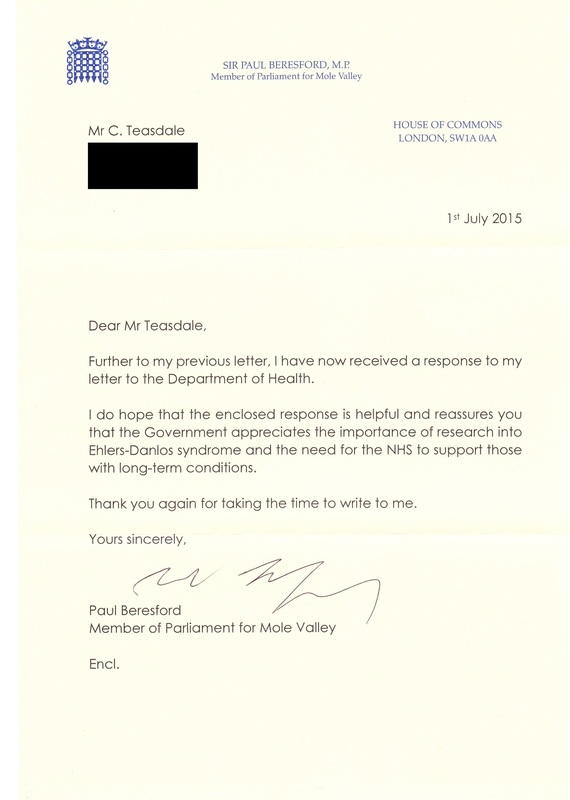 If I were you I’d respond, via the MP, thanking the Minister for a useful and understanding reply, but pressing on the issues of EDS promotion and management of the condition. Thank you. – Coincidentally, a couple of weeks after sending my letter I spotted Sir Paul Beresford in Leatherhead. He had a stall to meet constituents. I introduced myself and he remembered my letter. Party politics aside, he made a good impression on me. So yes, worth a further letter.